News: IM might be sold; Results from Canada 520; Embrunman, IM Mont Tremblant and IM Sweden are coming up; Challenge Bahrain course; Open letter to Bahrain 13. This Weeks Discussion: Is Ironman killing short course triathlon? If this is the case, what do you think short course races need to do in order to get people racing more often? Plus what would they need to do to get you racing more often? Comment here. Interview: This week we get Bob Seebohar back on the show to talk about nutrition for young triathletes. He shares many great thoughts on this important topic. 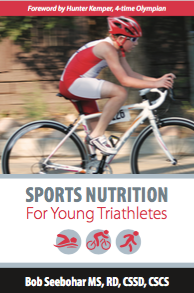 You can get his book, Sport Nutrition for Young Triathletes, by clicking here. Statstastic: We look at which races have the most climbing in them. Website of the Week: The Wiseone sent through www.cycleroute.org for this weeks website. It's a great site to figure our the terrain of your cycling routes. This Weeks Websites: Open letter to Bahrain.